Glue the cabochons to fabric. Let the glue dry. Work the basic row in J around the cabochon (fig. 1). The number of seed beads in the basic row should be multiple to six. Work the bezel in circular peyote stitch (fig. 2). Go through the last row for several times, pulling tightly on the thread. Trim away all the excess fabric as close to the basic row as possible. Glue leather to the back side. Let the glue dry. Trim away all the excess leather. Work the basic edge row in K (fig. 3). Embroider the edge in L, H (fig. 4). Work the ribbons in peyote stitch around the cabochons (pic. 1). Work the 1st peyote ribbon at the top part of the cabochon (fig. 7). Pick up 29N, work the second row in peyote stitch in N, work the third row in G. Go through the beads of the basic edge row at the end of each row. Slide the needle through the third G bead from the end and pick up 13N for the second ribbon. Work the second and the third ribbon in the same way. Pick up 25N and work the 4th ribbon in peyote stitch at the bottom part of the cabochon (see pic. 4). 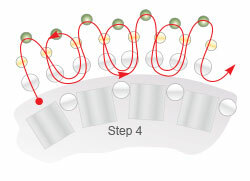 Pick up 19N and work the 5th ribbon beginning from the 3rd G bead. Bead the 6 th ribbon beginning from the 3rd row of the 3rd seed bead of the 5 th row. Bring the needle through the 4 th G seed bead of the 3 rd row of the 6 th ribbon and pick up 15N for the 7th ribbon. Attach the 7th ribbon to the 4 th G from the end of the last row of the 3rd ribbon. 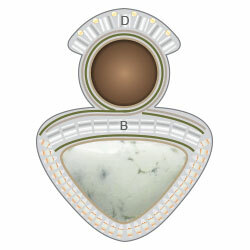 Work symmetrically on the other part of the cabochon. Work the circle in peyote stitch (fig. 7) and attach it to the middle G bead of figure 6. There beads are marked on figure 6 and 7. Pick up 27N for the 8th ribbon. 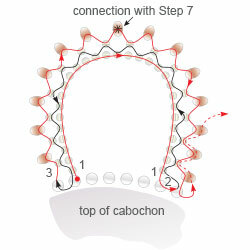 Connect the ring with the 2nd ribbon (pic. 4). Work the ribbon symmetrically on the opposite side. 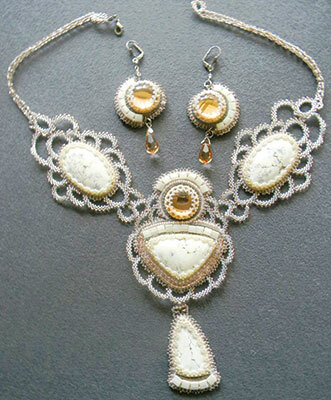 Make a full­size design of the central part of the necklace (pic. 1). Transfer the design to fabric. 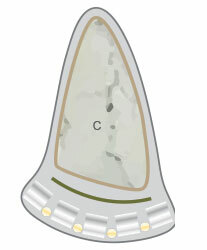 Glue B cabochon in the marked place. Let the glue dry. Work the basic row in J around the cabochon (fig. 1). The number of seed beads in the basic row should be multiple to six. Work the bezel in circular peyote stitch (fig. 2). Go through the last row for several times, pulling the thread taut. Sew H, F, I around the cabochon (pic. 1). Glue D cabochon in the marked place. 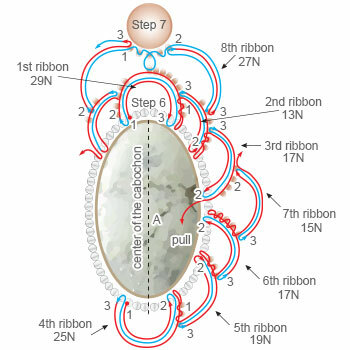 Sew the basic row in J around the cabochon (fig. 1). The number of seed beads in the row should be multiple to three. Work the bezel of the cabochon in J, M (fig. 3). Sew one row in H and one row in K around the embroidered D cabochon. Sew 7I to the top part of the cabochon. Trim away all the excess fabric as close to the edge beads as possible. Cut out the pattern of the detail, leaving about 1/16" (2mm) space around, using thin cardboard. Glue the pattern to the back side. Let the glue dry. Glue leather to the back side. Let the glue dry and trim away all the excess leather. Work the basic edge row in K (fig. 4). Embroider the edge in L, H (fig. 5). Work the peyote ribbons around the detail (pic. 5). Glue C cabochon to fabric. Embroider the cabochon in the same way. Sew 5I to the bottom part of the cabochon (pic. 2). Trim away all the excess fabric as close to the basic row as possible. Glue leather to the back side. Let the glue dry and trim away all the excess leather. Work the basic edge row in K (fig. 3). Embroider the edge in L, H ( fig. 4). Connect the central detail of the necklace with the beaded A, using peyote ribbons (see the photograph). Attach pendant with C to the bottom peyote ribbon of the central part of the necklace, using F, L.
Attach the strips to the rings (fig. 7), using F, N (fig. 8). 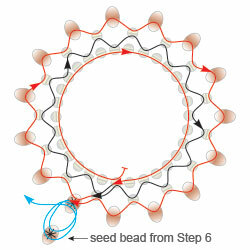 Work two peyote circles, stringing 20 seed beads for the 1st row (fig. 7). Attach the rings to the free ends of the strips. Attach the halves of the clasp to the strips. Glue D cabochon to fabric. Let the glue dry. Work the basic row in J around the cabochon. The number of seed beads in the basic row should be multiple to three. Work the bezel of the cabochon, using J, M (fig. 3). Sew one row in H around the cabochon. Sew 7I on the one side of the cabochon (pic. 3). Trim away all the excess fabric as close to the edge seed beads as possible. Sew the pins to the back side. Glue leather to the back side. Let the glue dry and trim away all the excess leather. Work the basic edge row (fig. 4) and embroider the edge, using figure 5 as a guide. Work the other earrings symmetrically. 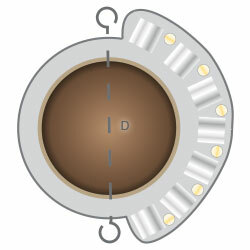 Attach the bead pendant to the holder of the pendant and attach to the pins, using the connected jumprings. 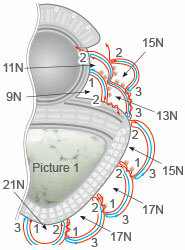 Attach the ear findings to the opposite pins through the connected jumprings.